Due to the large number and variation of yoga poses, there is a yoga for every body and circumstance. Therapeutic yoga teachers can help to develop a series of yoga poses and pose modifications that are appropriate to help rehabilitate the spine after spinal fusion surgery. Always consult with you doctor before beginning an exercise program, especially as the spine heals post-surgery. Spinal fusion is a surgical procedure used to correct afflictions such as scoliosis and spinal deformity, herniated disc, broken vertebrae and chronic lower back pain. According to MayoClinic.com, the operation is performed by fusing two spinal vertebrae together using a bone graph taken from the body. The spinal fusion surgery ceases the range of motion between the fused vertebrae. The surgery can correct spinal instability, but new pressure on the surrounding joints may cause degeneration along other areas of the spine. Rehabilitation from spinal fusion surgery is long and you may not be able to complete normal activities for at least four to six weeks. Heavy lifting and hard exercise is off limits for four to six months. MayoClinic.com recommends beginning a physical therapy rehabilitation program approximately four weeks post-surgery. 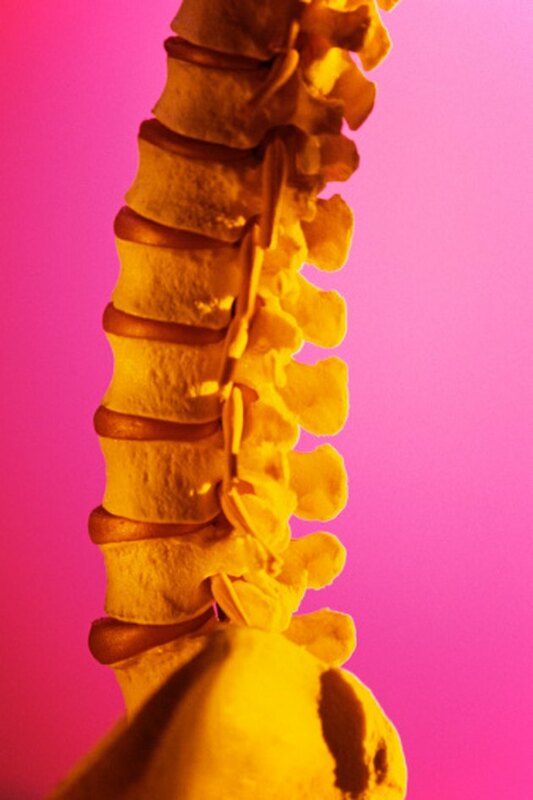 Nurse Practitioner Nicola V. Hawkinson on SpineUniverse.com writes about the need to put little pressure and strain on the spine after spinal fusion surgery. Hawkinson warns patients against heavy lifting, twisting and bending and recommends light, gentle exercise. Yoga is recommended for patients recovering from spinal fusion surgery. Although it is very important practice with a knowledgeable, experienced yoga teacher. Yoga teachers who have studied yoga therapeutics can help to tailor a yoga practice specific to your rehabilitation program. Not all yoga poses are appropriate for spinal fusion, and twists, forward and backbends are contraindicated. The fusion needs to heal and become solid, so movements which flex and twist the spine should be avoided. Hawkinson notes that regular yoga students should realize that their spine will inevitably feel differently post-surgery and they may not be able to access yoga poses in the same way as before surgery. Gentle standing and balancing poses maintain the spine's integrity and build strength and stability without flexion and twisting. Yoga standing poses such as Mountain Pose and Chair Pose focus on lengthening through the spine. Downward-facing Dog either on the floor or up against a wall also mimics a straight spine. Standing hip and thigh strengthening poses, such as Warrior I and II move the focus into the legs. Practice gentle static poses instead of a flowing sequence. Use yoga props such as blocks, straps and bolsters to support your practice and ease your way into each pose. Is Chiropractic Manipulation OK Post Spinal Fusion?